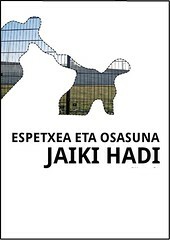 ataramiñe’05 Euskal Errepresaliatu Politikoen Literatura Koadernoen aurtengo edizioa salgai izango da Durangoko Azokan Amnistiaren Aldeko Mugimenduaren saltokian. Uribe Kostakoen aldetik Iñaki Gonzalo Casal “Kitxu”-ren narrazio labur bi eta Galder Bilbao “Txapi”-ren bertso sorta batzuk dakartza ataramiñe’05 honek. This entry was posted on 2005/12/07, 13:03 and is filed under Ekitaldiak. You can follow any responses to this entry through RSS 2.0. You can leave a response, or trackback from your own site.